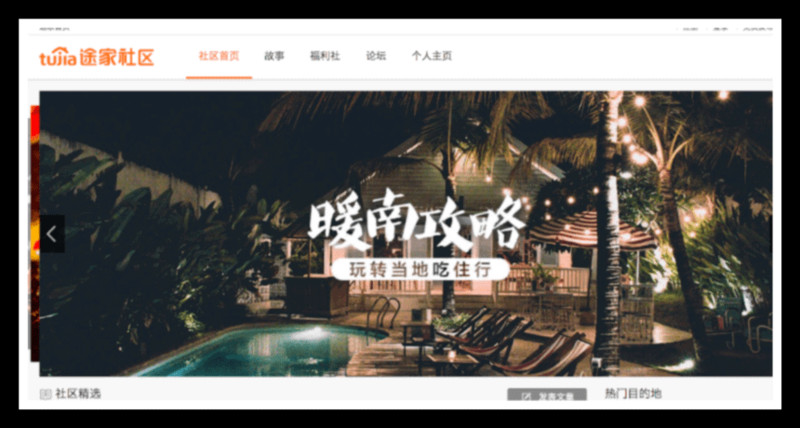 Branding & Quality Consistency: What startup vacation rental property management companies can learn from Airbnb Plus, Stay Alfred, Tujia and others. Brands, created by property management companies like Lyric, Sonder or Domio, as well as by OTAs (e.g. 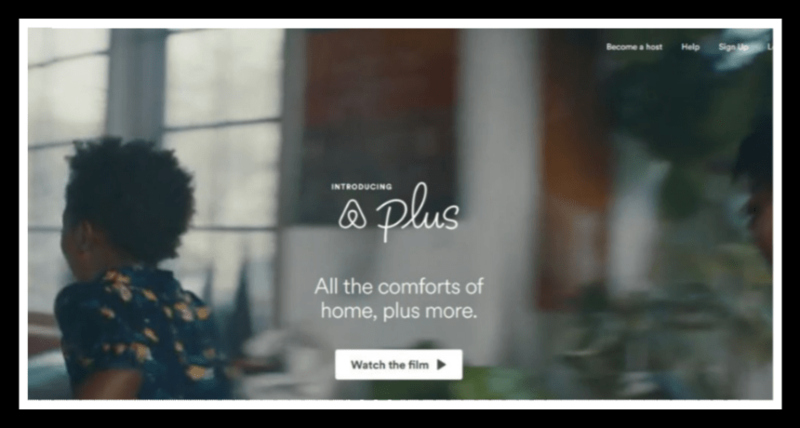 Airbnb Plus, Tujia in China), promote consistency of experience. The idea is that guests will then book one of these branded places with more confidence. As an owner of multiple properties or as the manager of a smaller, but fast-growing, vacation rental company, why should you care about what these bigger companies are doing? Most of you RentalPreneurs who are part of our community of readers own and/or manage anywhere from 3 to 500 properties. When asked about what keeps you up at night, you’ve told us about hiring the right people, about automating cleaning schedules or about finding a better channel manager. Branding seels to be there, down on your list, but not as the top priority. Big players like RedAwning have for years offered smaller property managers the possibility to join a marketing network, where all properties are re-branded under the RedAwning brand and distributed across multiple channels like Airbnb, Boking.com, and HomeAway. Property managers stay independent but leverage the marketing muscle of RedAwning. So, the idea of foregoing brand-building to focus on delivering a great guest experience and making homeowners happy is not new. want to add some of your existing supply of properties to these soft brands (e.g. Airbnb Plus, Airbnb Beyond, Tujia franchise). This way, you would use somebody else’s brand and have them spend money on marketing, while you would still be showcasing the quality of your own property and services, while you are busy investing your time and money in people, tech and operations (For some caveats about Airbnb Plus, see below). want to invest in similar ways as Sonder or Domio, buying or long-term leasing properties within the same building. This way, with a commercial lease in hand, you may be able to avoid some short-term rental regulations. You may also easier control the quality of each property and faster achieve economies of scale by using similar designs or dispatching cleaners within one building instead of across a resort area. want to have another look at serviced apartments: Even if our industry was born out of vacation rentals located by the sea or in the mountains, some key areas of growth do reside in serviced apartments located in cities. Some reasons are that OTAs are quite good are delivering bookings in cities and that this property format can generate higher-value bookings by attracting corporate travelers and higher length of stay (LoS). In China, you can find dozens of buildings and short-term rental apartments branded with the name of online travel platform Tujia (tujia.com international). Airbnb introduced in February 2018 its Airbnb Plus program, where inspectors visit and assess every property. Urban short-term rental management company Sonder (sonder.com) not only rents apartments to guests but also goes as far as designing and furnishing every one of its apartments. What can you learn from these brands to apply to your own strategy? => What pain are these brands trying to solve? As a guest, when you book a room in a hotel chain, say Hilton, Ibis, or Marriott, you trust that the bedroom will have some standard features (e.g. a bed, a TV, a shower, toiletries) and that it will be clean and safe. You trust these hospitality brands to deliver this, consistently, every day, and even across the world. Yet, when you a vacation rental home, you sometimes feel that you have to make a leap of faith: The amenities of vacation rentals can differ vastly from one place from another, even when offered by the same property manager. As for services, they can range from absoltuley nothing to concierge-like levels. => What solution do these brands bring about ? How to create trust in a consistent experience? An answer can be by creating new brands which promise and deliver such hotel-like consistency for vacation rental homes and apartments. – “Comfort of a home. Confidence of a hotel.” (Domio). In terms of property types, it is easier and more cost-effective to offer this within multi-unit properties (a.k.a. multi-family buildings) offering several apartments (type 1 brands, see below). Yet, some brands are betting that they can yet offer such hotel-like services in apartments and villas spread out across a city or a resort area, by curating these places under high standards, in a classic, but high-end, property management model (type 2 brands). 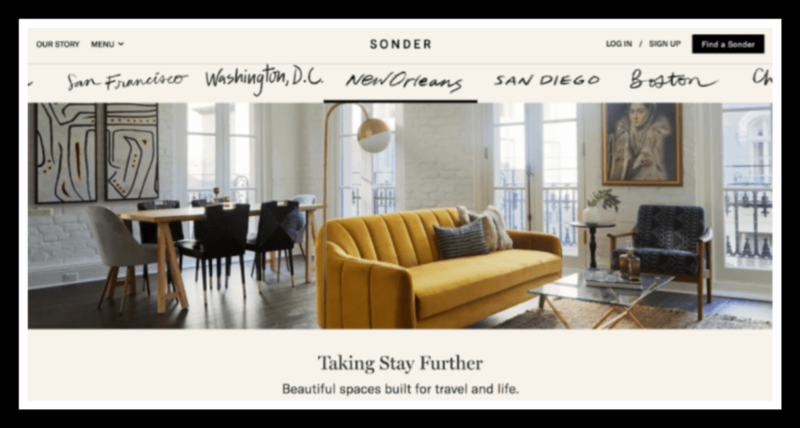 Brands like Sonder actually design, outfit and operate their own places. They typically take on a block of apartments within the same building, rent it with a long term lease and redesign them. The owners are not individuals, but usually real estate companies. Here’s how Sonder presents itself: The consistency and service of a great hotel that doesn’t come in a typical hotel format, combined with the warmth and comfort of staying in a space that feels more like a home, and the ability to choose the perfect location from the best neighborhoods in cities around the world. Same model, long-term lease in a building, then bring out its own designers to remodel and furniture the apartments. Same model. Their tagline: “Creative Suites for the Modern Traveler”. Chine online platform Tujia, a direct competitor to Airbnb, Booking, and HomeAway, has grown by going after large chunks of supply at once. For instance, Tujia lists whole building towers that real estate companies had to rent out as they could not sell the apartments to individual owners. Yet, this oversupply story has worked so well that Tujia has now set-up a franchise model: Buildings pay Tujia to use the Tujia brand. Tujia has been doing this for years, so the novelty of Airbnb having its own franchised buildings in the US does not look so new when looked at from China. Tujia also has its own offline services (e.g. cleaning teams) that can make sure that the guest experience is consistent every time in a Tujia-branded buildings. (More here about the amazing Chinese short-term rental market, Tujia international and Airbnb China – Aibiying). Are they just jazzed-up serviced apartments? Note that this consistency for apartments is also the original promise of good old aparthotels / serviced apartments. In a way, from the consumer viewpoint, Sonder, Lyric and the rest are a sexier version of AccorHotels’ Adagio chain. 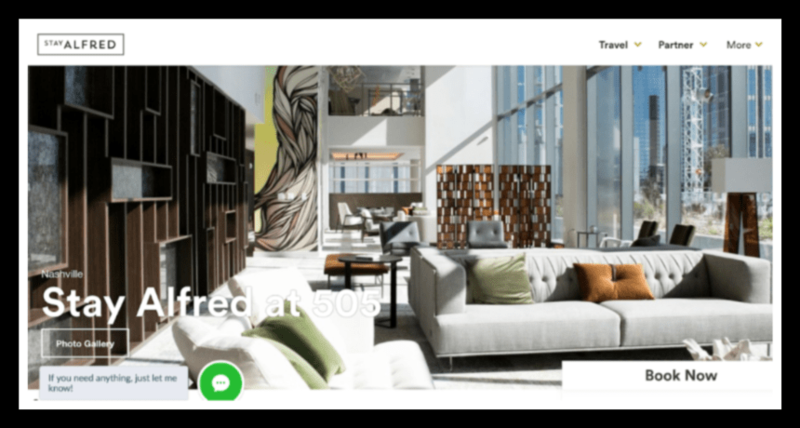 Ascott, the owner of the Citadines Apart’hotels chain, is also coming up with exciting “co-living / social apartments” in Asia with its Lyf by Ascott http://www.lyfbyascott.com offering. As a vacation rental owner or manager, you know that luxury vacation rental management companies have been curating villas and apartments for decades. They always inspect a house they list and try to come back every other year to assess whether the places are still up to standards. These property managers were mostly active in ski and resort areas. (e.g. 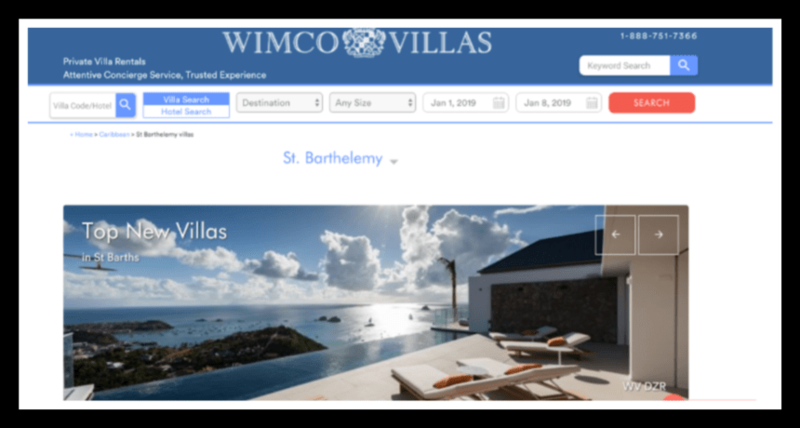 WIMCO in St Barths). onefinestay, now owned by AccorHotels, was a pioneer into this: Selecting high-end apartments owned by private individuals, then, during a guest’s stay, carefully taking away the owner’s personal stuff and replacing them by linens, towels and more given by OneFineStay. They would also give an iPhone to the guests, to call an on-demand concierge who could arrange everything from airport taxi to restaurant bookings. In August 2013, Thibault was among the first in Paris to list a luxury apartment rental on onefinestay. 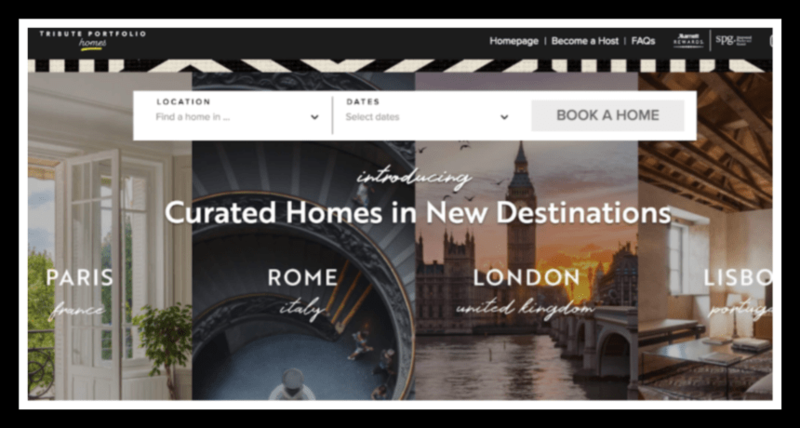 Oasis Collections and some of HostMaker’s properties have similar features to OneFineStay. Just like AccorHotels, hotel chains like Hyatt and Marriott wanted to join the action. Hyatt used to rent out Oasis Collections listings via its soft brand “The Unbound Collection”. In October 2018, Oasis Collection was subsequently acquired by giant property management company Vacasa. Marriott distributes 200 HostMaker-managed properties in a trial in London via its soft brand “Tribute Portfolio Homes”. Smaller property managers: Operations, tech, and people first. Branding second. It is interesting that big players like Vacasa and RedAwning are doubling up on building brands, while some OTAs (e.g. Tujia and Airbnb) to have been establishing their own franchises / soft brands. Companies that are building their strategy through a controlled, standardized supply (e.g. Lyric, Sonder, Domio) have also an interest in building up their brand, as the branding here is supposed to draw in guests who want a predictable, high-end experience. Yet, creating a strong, visible brand may not be priority number 1 for a startup or even for a scaleup company working in the vacation rental industry space: Topics like hiring the right people, saving time by automating processes or upgrading to another channel manager may more on their managers’ minds. Yet, the topic of offering a consistent guest experience is really what these branding efforts are about. You can choose to test out some of these offerings, for instance by listing a couple of places with Airbnb Plus. If you invest in vacation rentals, you can also take inspiration from brands like Stay Alfred and focus in buildings where you can rent out several properties at the same time and achieve some economies of scale.